Left Picture: Miles Davis played by Don Cheadle. 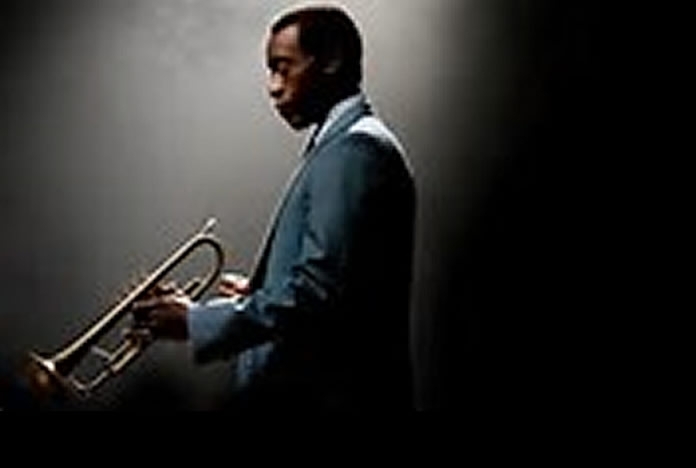 Earlier this year, despite my reservations, I steeled myself, took a deep breath and trotted down to the local multiplex to see Miles Ahead, a labour of love over many years from the actor Don Cheadle who plays Miles Davis and also also directed the film. The scene is set in 1975 when Miles had been going through some sort of artistic block, consoling himself with whisky, heroin and whatever came to hand. Mr Cheadle had obviously wanted to avoid a Hollywood biopic formula so the film is a mishmash of Miles’s music and a dodgy plotline involving Ewan McGregor as a helpful rock journalist, valuable tapes which are stolen, car chases and gun battles worthy of Al Capone’s Chicago. Was it all really necessary? Throughout all this, Miles flops around in outrageous costumes, snapping, glaring, threatening, and continually using his favourite word, “motherf***er”. Anyone who has read Miles’s autobiography will already know he was a complex human being - paranoid, racist towards whites, often hate-filled and contemptuous of nearly all his fellow human beings. Mr Cheadle certainly portrays all those aspects with great skill. Mercifully (for me at any rate) the film avoids Miles’s later change to fusion when he pranced about in loon plants while a horrible electronic racket occurred behind him. Starting as a young trumpeter and heroin scorer for Charlie Parker, Miles’s career ensured his immortality as an artist - from the “Birth of the Cool” orchestra, “Kinda Blue”, the Gil Evans orchestrations of "Porgy and Bess", "Sketches of Spain" and others, his sextets, quintets and quartets featuring Bill Evans, John Coltrane, Herbie Hancock and numerous other jazz immortals. But the film is littered with irritating moments and just to mention one; Miles giving Gil Evans tips on arrangement during the recording of one of their magnificent collaborations. What a preposterous thought! It is sad to say that this dedicated work by Mr Cheadle about a legendary and original musician doesn’t really pass muster, despite his impressive acting performance. If, like me, you love Miles’s music the best thing to do is to sit and play your favourite Miles CDs without a lot of confusing cinematic nonsense going on at the same time. Left Picture: The Cat’s Pyjamas? Miles (Don Cheadle) with Ewan McGregor. The other 2016 film, Born to be Blue, chronicled the life and travails of trumpet player and renowned junkie, Chet Baker (played brilliantly by Ethan Hawke), a farm boy from Oklahoma whose talent gradually became lost in a haze of narcotic addiction. Initially Chet was a PR man’s dream. Catapulted to fame in the Gerry Mulligan Quartet, he had everything - angelic “James Dean” looks, a huge talent on trumpet and a fine voice too (vocals by Hawke himself). 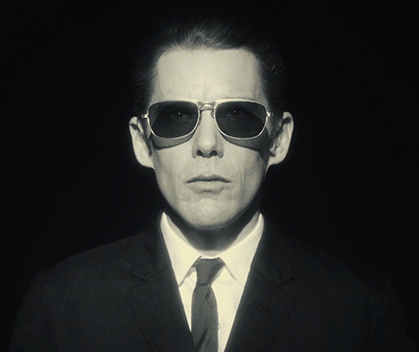 Left Picture: Ethan Hawke as Chet Baker. The movie, written and directed by Robert Budreau, appeared all too briefly in London cinema art houses. I missed it and had to make do with a video on my computer screen which was a shame because the cinematography, even on a small scale, was really stunning. 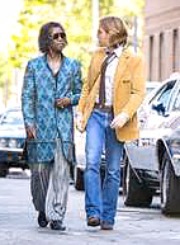 Much as Don Cheadle’s Miles Ahead played towards the mainstream, writer and director Robert Budreau, has gone for a kaleidoscopic mix of monochrome and colour, present and past, fact and fiction, in no particular order. Naturally some scenes are more memorable than others. The early sequence whereYoung Chetty, rising fast in the jazz popularity stakes, makes his debut at New York’s Birdland, is outstanding. Shot in mono, he is introduced as the “prince of cool” and plays outstandingly well, watched by Dizzy Gillespie and Miles Davis, who are also on the bill. 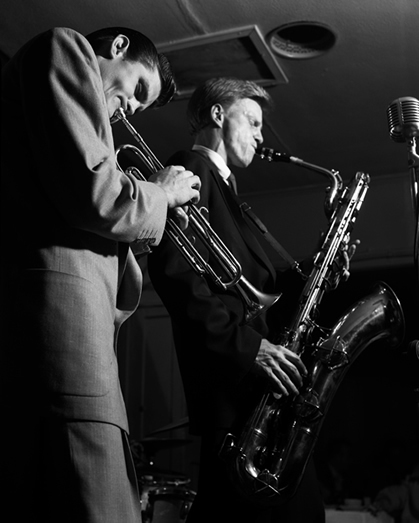 Left Picture: Chet in his days with the Gerry Mulligan Quartet. Miles, as unfailingly helpful and courteous as ever (not), finds his efforts like “candy” and advises him to “go back home to the beach”. Chet, always a ladies’ man, even when well under the influence, figures in many arty shots - playing on the beach, on top of his camper, strolling along with his latest conquest. These can become somewhat repetitious and tedious, but I am always a sucker for art cinema. Another superb scene sees Chet returning to this parents’ bleak Oklahoma farm to introduce his girlfriend. He is desperate for love and approval from his tough old daddy but gets neither and is sneered at for “singing like a girl”. In mid-career, Chet failed to pay a drug dealer, was badly beaten up, losing his front teeth in the process. Another gruesome but graphic scene depicts Chet lying in a bath trying to play with blood spurting out of his mouth. He cleans up. slowly starts to play again with artificial dentures and manages to revive his career although his heroin habit stays. The film ends at this point but screen titles tell us of his 1988 death in Amsterdam, under mysterious circumstances, aged 58. If we are taking a guess on posterity, Chet will never be seen as massive a jazz figure as Miles. He was a superb trumpet player but in no area matched the enormous presence and influence of Miles. However as far as cinema is concerned, Robert Budreau has given us a far superior work than Don Cheadle, regardless of respective heroes.